Girls with Impact was started by a single mom raising two girls of her own who said she understood how tough it was for women to "get ahead — and stay ahead." Jennifer Openshaw, CEO and founder, wanted to help young women learn how they could create a business or become a CEO as a natural evolution of their own interests and skills. The "teen mini-MBA" program delivered by Girls with Impact lasts 12 weeks and takes cohorts of up to 20 participants through strategy and problem solving, marketing and social media, budgeting and financial literacy, team management and leadership, and networking and working with advisory boards. Through the 12 weeks, the girls also create business plan, setting themselves up as CEOs of their endeavors. Girls attend weekly online 50-minute classes delivered in real time by experienced coaches, all holding MBAs or something related. "Homework," called "BringBacks," take another hour each week. The organization said its curriculum was developed with input from Harvard experts. Openshaw herself has taught business and entrepreneurship at New York University. For graduates of the program, Girls with Impact offers a "boardroom" with twice-monthly online sessions in advanced topics, networking, and mentoring. Tuition is on a sliding scale, up to $495 (subsidized from its published program value of $2,000). The organization also offers scholarships. One recent project that's getting publicity because of its national timeliness is "In Case or Deportation" or I.C.O.D., developed by Jody Bell, now a senior at Greenwich High School in Connecticut. Bell said she developed her website to be a "go-to resource with the latest information and guidance," but delivered for visitors ages 8 to 18. 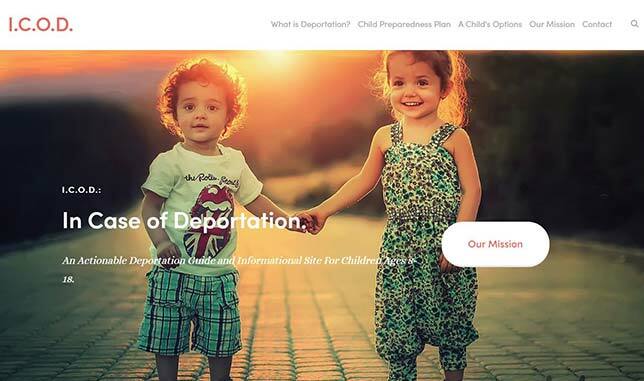 Besides explaining what deportation is and what steps a child should take if his or her parents are suddenly deported, the site also offers guidance on what to do during a U.S. Immigration and Customs Enforcement "raid" ("do not open the door," "report the raid" and "stay silent"), how to prepare for a possible raid and how to have a talk with parents or guardians about their legal status. "Girls like Jody are looking to solve big problems facing our world," said Openshaw in a press release. "By equipping them today as tomorrow's CEOs, we improve their success, our communities, and our workplaces." Girls with Impact is taking applications now for its 2018-2019 programs, the first beginning Sept. 24, 2018 with three cohorts.